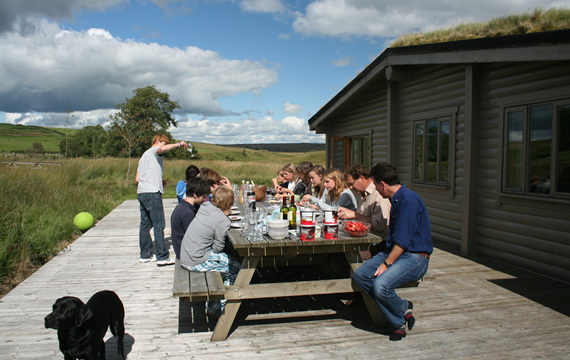 A unique 9-bedroom log cabin that sleeps 20 comfortably on the Garpel Estate in Ayrshire set in the wide open spaces of the Central Southern Uplands of South West Scotland. 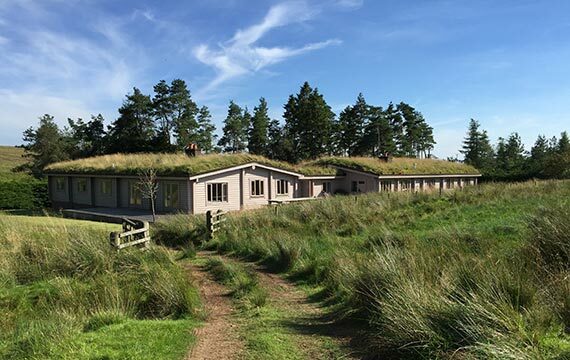 The Log House was built in the 1970's to create an environmentally friendly, economic dwelling that would provide comfortable, characterful accommodation for family and friends, shooting parties and other guests. 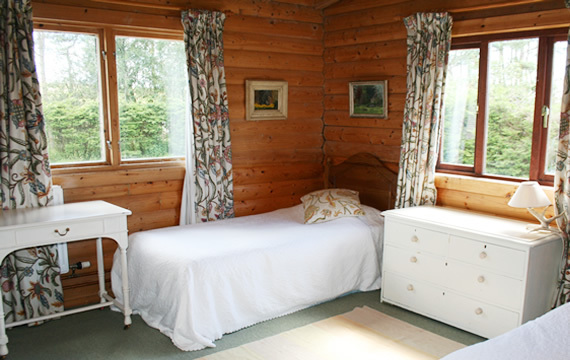 You'll find further information below including details of the facilities at The Log House, a useful floor plan and details of local amenities such as shops, pubs and restaurants. 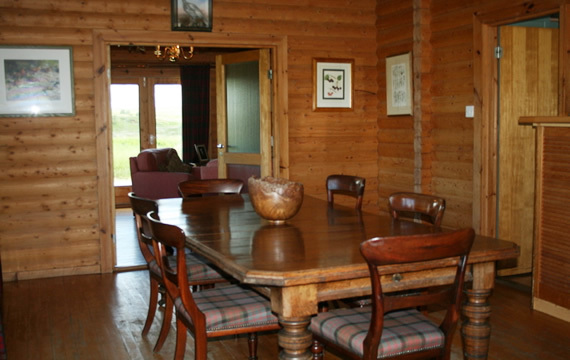 The Log House was built in the 1970's with a view to create an environmentally friendly, economic to run dwelling that would provide comfortable, characterful accommodation for family and friends, shooting parties and other guests. 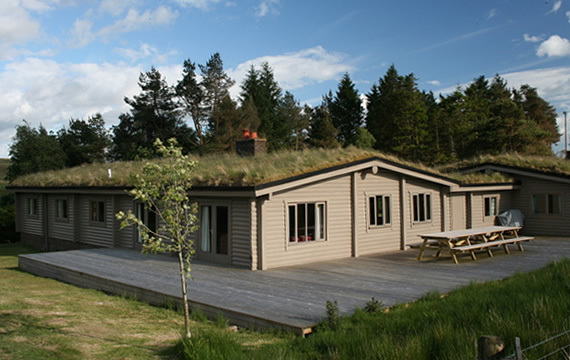 It was constructed with the help of local builders to a Norwegian design and is actually two cabins joined together to form one spacious nine bedroom house. 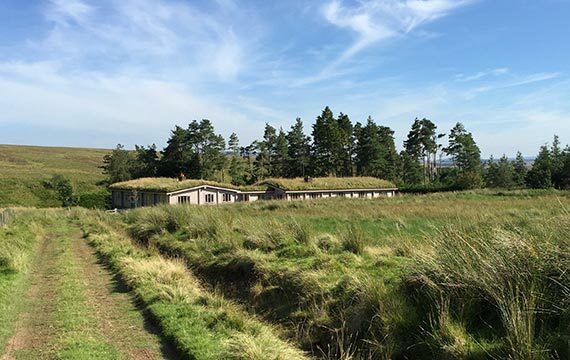 The roof really is turfed for insulation but it does need to be periodically cut although care has to be taken for nesting birds in May/June! The Log House has featured in Vogue, Scotland on Sunday and The Home Show. Linen: Linen and towels are provided. Heating: There is an oil fired central heating system which will protect visitors from the worst of the Scottish cold. Each radiator has its own setting control. 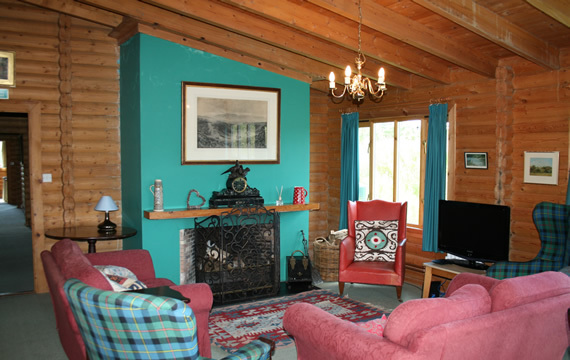 In addition, both sitting rooms have log fires and there is an ample supply of logs in the wood store to the front of the house. Hot Water: There are two large tanks supplying hot water for the bathrooms and wash hand basins in each bedroom. Television and DVD / WiFi: There is a TV with DVD. WiFi is also available. Rubbish Collection: East Ayrshire Council has introduced a new recycling and waste collection scheme. Rubbish is collected from the road end every Thursday but needs to be put out at the road end in the bins provided on Wednesday night. The Log House was constructed to a Norwegian design and is actually two cabins joined together to form one spacious nine bedroom house. For basics, the Co-Op in Muirkirk stocks quite a wide range of the "staples" and the Toll Garage has a SPAR attached which is open for slightly longer hours and has the main newspapers. There is also a chemist, butchers and Post Office. For a wider range of the "staples", the SPAR in Mauchline is also good. The nearest supermarkets are in Ayr, which has most of them, although I always go to the Tesco on the main road into the town centre as it is the most convenient. The town centre itself has a wide range of shops and restaurants. 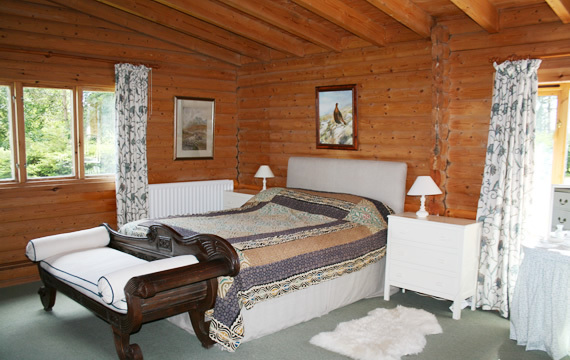 Locally, The Sorn Inn Hotel is good having recently been renovated. Another good pub is the Failford Inn in Failford overlooking the River Ayr on the way to Ayr. Belhaven is the local brew. There are also a number of great fish restaurants in Troon and Prestwick. You can, of course, have an exceptional dinner at the Turnberry Hotel, although it is quite a drive.